THE Queen had every reason to smile at the royal wedding and it was nothing to do with the bishop's colourful sermon. Royal commentators believe the marriage of Prince Harry to Meghan Markle was a game-changer for the House of Windsor. 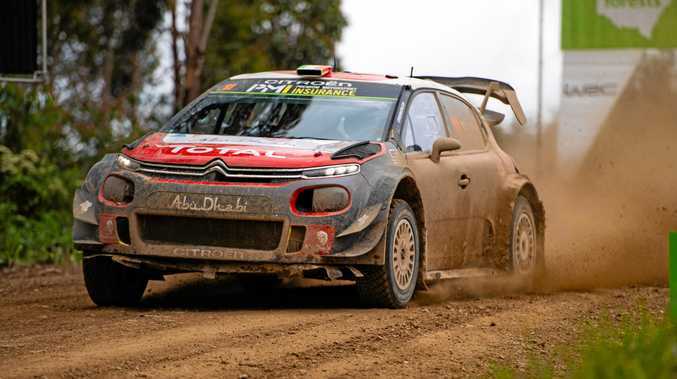 "I think it shows they are able to change," writer and royal expert Stephen Bates told news.com.au. "Maybe they don't change as quickly as other institutions, but the idea that a divorced American of mixed race who has a professional career would marry into the royal family would have been inconceivable only 20 years ago. So I think that's great." Those attributes are common in modern Britain and not typically seen as negative, as they used to be. Bates, a former royal correspondent and the author of Royalty Inc, says the former Suits actress is a big part of what is coded "The Marmite Strategy" by palace aides. "When I was writing my book, it was said to be the marmite strategy everyone knows about," said the writer, whose book chronicles how the royal family has evolved over time to maintain popularity. "This little pot of yeast extract that the British are attracted to - it looks like a heritage product, unchanging, a bit old-fashioned looking on the outside." 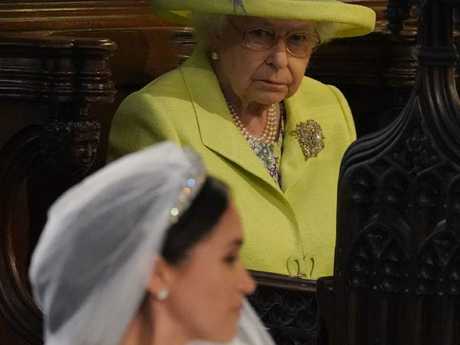 Queen Elizabeth II looks on during the wedding ceremony of Prince Harry and Meghan Markle. The reality was marmite had changed considerably over the years, including the recipe, colouring of the pot and the colour. "Everything has changed and yet nothing seems to have changed," added Mr Bates, who has covered numerous overseas tours, visits, deaths and scandals during his career. "And it sort of banks on that. The Royal Family is a bit like that ... royal courtiers used to say to me 'it's the marmite strategy' - everything changes, but nothing seems to on the surface." 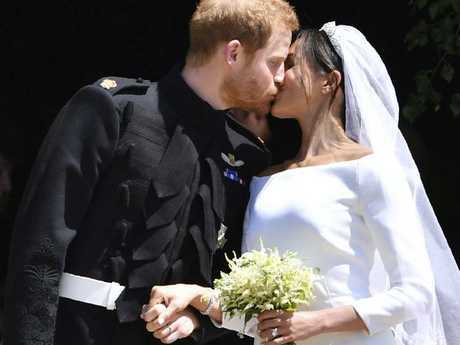 That was no more evident than at Saturday's wedding at Windsor Castle's St George's Chapel, a "joyful occasion" watched by people all over the world. "I liked the innovations they had [because of] Meghan's background, the gospel singing and particularly enjoyed the bishop's sermon," said Bates. "I thought that was great." While many wondered what the Queen would think of Reverend Bishop Michael Curry's passionate sermon, as pictures showed senior royals smirking, Bates believed the mere fact he was there and felt free to give the sermon was a turning point. "I thought all credit to him for injecting a bit more spirit into his address ... more than I think a member of the Church of England could have managed." Bates thought the impact Meghan, now Her Royal Highness the Duchess of Sussex, would have would on the monarchy might not be felt as dramatically because she wasn't going to be Queen, unlike her sister-in-law Kate, the Duchess of Cambridge. But he noted: "They're clearly very devoted to each other, which has not always been the case in the past, with Charles and Diana." Bates added: "She broadens the gene pool really, she brings a different perspective and also a different appearance, beyond the obvious, to the Royal Family. She is bound to make them appear less stuffy and to inject different ideas into their gene pool. I think it's very good for the monarchy." Meghan has brought the monarchy her feminist, liberal views on issues like gender equality as well as being a successful professional actress, which will help her when she is on public display - which she effectively will be for the rest of her life. "She has those skills, so I think it's great news for the royal family," said Bates. "And I think they know it too ... almost pathetically grateful." 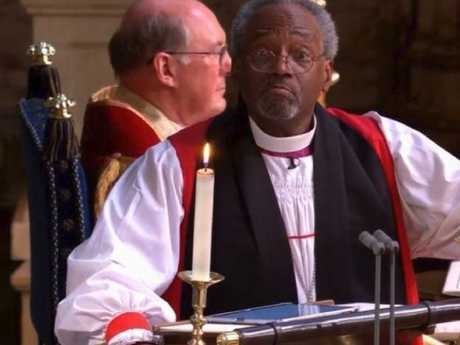 Bishop Michael Curry speaks at Prince Harry and Meghan Markle’s wedding, Windsor. Even Meghan's high-profile family woes last week would have been dismissed by the Royal Family. "Again, 30 years ago they wouldn't have considered Meghan as a potential bride so family wouldn't come into it. But every family has dysfunctional members." With both the Queen and Duke of Edinburgh in their 90s and Prince Charles approaching 70, the addition of Meghan will bring some much needed glamour. "In one sense the monarchy's problem is they are all living to very old ages, especially the Queen," said Bates. "That comes at a price. "The Camelot glamour is in short supply, you need that touch of sparkle and fairy dust to maintain the brand, the youth and vigour of it." Even Prince William would likely not become King until late middle age, which Bates said was a "serious problem for the royals". "It doesn't renew the brand or the image - admittedly little Prince George and Princess Charlotte and Prince Louis will be the next revolution of the soap opera. "Even when I was daily royal correspondent, the picture desk was always saying 'why take pics of William?' So that's a problem for them. They can't afford to be too middle-aged and middle-class. "They have to be respectable, otherwise we will have the sagas like 25 years ago with Diana and Squidgygate and so on. But they do need a sprinkling of magic, and if Meghan brings that, then I'm sure they'll be thrilled." Bates thought the fact both Prince Harry and Meghan were in their 30s meant they brought a maturity to their decision-making. "It seems impossible to believe, but Meghan is now the same age as Princess Diana was when she died." The author thought the only possible trouble could come if Meghan was prevented from speaking about causes she cared about and was thwarted from taking an activist stance on issues. "Presumably she is aware of that." She has already shown plenty of signs at adapting to her new life, reportedly learning royal protocol and the proper way of holding a tea cup before she met the Queen. Her social media accounts and websites vanished too, although that tipped in the royals' favour when their accounts saw spikes after she was engaged to Prince Harry. "I hope it doesn't constrain her too much and she is given the freedom to continue be active and say uncomfortable things occasionally," said Bates. The kiss that was seen by more than a billion people. Biographer Andrew Morton, author of the recent book on Meghan, A Hollywood Princess, believed she would be active and forthright. But that wouldn't mean she would cause havoc for the royals, Morton told Fairfax. "Meghan is a smart girl. She will realise the monarchy has been around 1000 years and she is not going to start throwing her weight around in the early days." He thought her energy and different perspective would require her new family to alter the way they behaved. "The people inside the royal family are going to have to up their own game." Not everyone is happy about the "celebrification" of the monarchy. June Ash, chairwoman of the Arts Society on the island of Jersey, told The New York Times she was worried the monarchy would dissolve into celebrity. "We're talking about medieval times, there's a history that carries through. You can't just say that it's celebrity. If we go down that route, it would be wrong. I hope it will stop at a certain point." There wasn't this fear around Kate joining the family, she said. "Kate, again, she is British, she knows the rules, American people are much more free in their way of thinking and their attitudes."